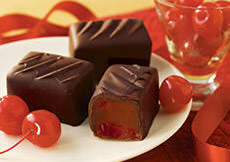 Sensationally smooth and fruity nut-free chocolates! 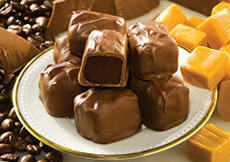 We've drenched our nut-free candies in a luscious blend of milk and dark chocolate. 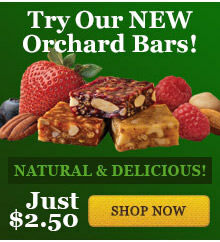 Each box includes five fabulous fruit flavors: Raspberry, Orange, Cherry, Coconut and Strawberry. Kosher. INGREDIENTS: sugar, corn syrup, chocolate liquor, cocoa butter, milk, modified corn starch, fruit juice concentrates (strawberry, raspberry, cherry), dried cherries, pectin (pectin, disodium diphosphate, sodium polyphosphate, dextrose, dicalcium phosphate), butter oil, natural flavors, soy lecithin, sodium citrate, citric acid, malic acid, yellow 5, yellow 6, red 40. I bought this product along with the caramel dreams. I rate this slightly higher only because it is tolerable to eat. The picture is not representative of the product and neither are the previous reviews. I felt like I was mislead to believe that the items would be of quality while in fact the product quality is cheaply made and I would not repurchase. Do not waste your money but spend it at a better store with higher quality products. These are the best candies I've ever tasted! The quality, taste, and texture are exquisite! I just got a box of these and they were excellent. 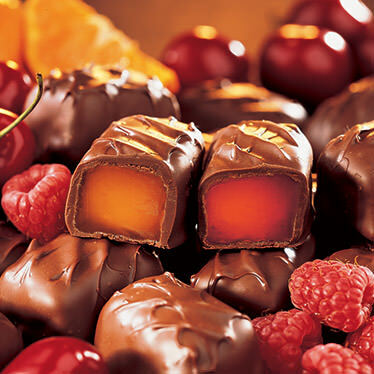 I love the combination of tangy fruit and chocolate. 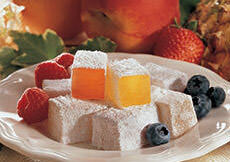 Reminds you of those raspberry jelly candies, only with much more authentic fruit flavor.